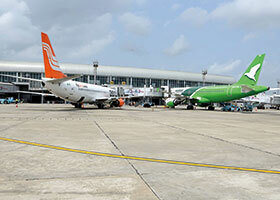 Murtala Muhammed Airport Terminal Two (MMA2) is Nigeria’s preeminent air terminal. In 10 years of operation it has achieved its objective of becoming a world-class airport operator, setting new standards for the African aviation industry. As the country’s first and only privately-funded terminal, its unique structure, ultra-modern facility, world-class terminals, customer service, safety and security are celebrated in the industry. Three thousand passengers move through the terminal each day and it is a secure working environment for more than 2000 people. It also boasts the first and largest Multi-Storey Car Park (MSCP) in Lagos, Nigeria’s economic nerve centre and financial hub. The MSCP can conveniently accommodate 800 cars at any point in time. In 2014, MMA2 was rated the best airport terminal in the country by the Federal Ministry of Aviation. The airport is funded and operated by Bi-Courtney Aviation Services under the PPP concession agreement between the Nigerian federal government and Bi-Courtney. The terminal has been renovated several times over the years, and has now become a benchmark for how an airport should operate. One important component of this is the airport’s recently upgraded video surveillance system, which modernised the earlier hybrid system. The old system was comprised of 60 Pelco analogue high-speed dome cameras, four Pelco hybrid video recorders and a Pelco matrix/switcher controller. While still functional, the old system could no longer meet either the safety and security challenges of the airport in a post 9/11 world, or Bi-Courtney’s long-term operational needs. Functionally, it was challenged by what was synonymous with typical analogue systems – low throughput, low resolution, low video retention and limited storage. Added to this was the problem of decaying infrastructure, the high cost of maintenance and incessant communication failures. It was more than ready for replacement. To ensure that all bases were covered and their needs would be met, Bi-Courtney Aviation Services started the upgrade process by commissioning a consultant for a site survey and issuing an RFP. Based on a number of factors including system design, product features, cost, local support capability and experience, the bid was awarded to BOW Dynamic System with a Pelco system design. According to A.O. (Adeniyi) Ajayi, director, operations and engineering of BOW Dynamic Systems, airport management had a simple goal in mind for the upgrade – to offer a safe, secure and pleasant experience to passengers in all parts of the airport, ranging from the parking lot to the lobby and check-in terminals, as well as baggage claim points, cargo areas and apron. Finding the right technology partner was imperative to achieving this goal. At the core of the new system design is the Pelco open platform VideoXpert Video Management System (VMS), which is an upgrade from the previous Pelco Endura VMS. The VMS maintains the database of the newly installed Pelco cameras and recording devices as well as integrated analytic software. The VideoXpert platform allows the aggregation of the various systems into a single, intuitive user experience which is accessed through a convenient Web interface for system navigation. By unifying operational and security data all via a single user interface, airport management has an intelligent end-to-end IP video solution for proactive response to situations within the terminal. The replacement video surveillance cameras are another critical upgrade to the overall security of the airport with improved image quality, streaming and on-board analytic capability. In total, 187 Pelco cameras made up of 21 different models are in use throughout the facility so that the best combination of technology, lenses, and other factors are used to meet the needs of each location. For outdoor surveillance around the airport and in the airport lobby areas where the lighting conditions change throughout the day, BOW installed Pelco’s low-light Sarix cameras. High resolution Spectra pan/tilt dome cameras are used in the parking structure, baggage claim points, cargo area and other parts of the airport, so that in the event of an incident or alert, critical identifying features can be seen in HD detail. Optera panoramic cameras with pan/tilt/zoom capabilities provide additional situational awareness. Most of the cameras feature Pelco’s SureVision technology for improved Wide Dynamic Range (WDR) performance and smart compression technology for reduced bit rate usage and storage savings. According to Akeem Saliu, BOW project manager, the cameras’ suite of built-in analytics provides the airport’s security team with increased advantage that enable them to be more productive and ultimately enhance overall security of the airport and surrounding areas. For video archiving where a minimum six-months of video retention is required, BOW installed seven NSM servers for a total of 384 terabytes and three storage pool devices on RAID 6. The NSM provides automatic distributed load balancing and active-active failover within a storage pool to ensure continued recording if catastrophic failure occurs. The design-build features two control centres, one for operations and one for security. The security centre has a video wall with six 55-inch screen monitors, as well as four 24-inch screen monitors dedicated for alarms, event management and analytics reports and two desktop screens for each of the two operator’s workstations. The operations centre focuses on apron activities, airfield, hangers and take-off and landing of the aircraft and has two 46-inch screen monitors as well as two 24-inch screen monitors. Additionally, the operation centre client is used remotely by both the CEO and CSO (Chief Security Officer), where they can call on any camera for forensic purposes or for an overview of operations within the facility. “BOW’s network design, configured by certified CCIE personnel, features a star topology with remote intermediate distribution frame (IDF), which is connected to the main distribution frame with fibre optic cables. The unrestricted architecture is designed to scale and accommodate future growth. Network security, switching and routing complies with industry and cybersecurity protocols. The design, system architecture and project delivery is an unprecedented success both for the aviation industry and the system user,” reported by Adeniyi Lawal, BOW IT support manager.